How attractive and appealing this Rice looks, Isn't it?....but the sad part is this Traditional rice variety is not known to many of us. 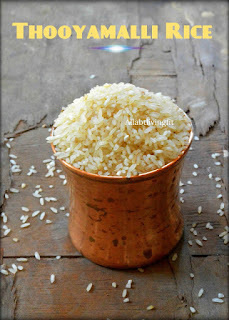 This rice is called Thooyamalli/Thuyamalli Rice, is one of the indigenous rice variety of Tamil Nadu. Ever heard of a famous Tamil quote?? "Unave marunthu", Our great great grand fathers and grandmothers used to consume nutritious food, which acted as a medicine too. You will be amazed to know that each and every rice variety has its own unique flavour along with high medicinal values. Why did it get the name "Thooyamalli"? Thooyamalli means Pure (Thooya) and Malli (Jasmine). This Rice looks more like a Jasmine bud and is the reason for the origin of its name. This Rice crop's duration is 135-140 days with high resistance to pest. So it will not demand much of pesticide like other common rice varieties. A healthy as well as a tasty rice which is best suited for preparing briyani for its distinctive flavour. "Do we still need to eat polished white rice which gives no nutrition at all?" or "Want to switch over to these traditional rice varieties which gives loads of nutrition and healthy life?"